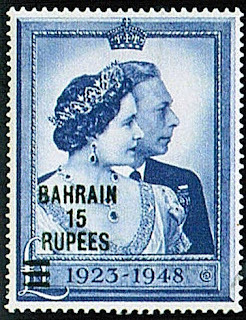 In 1948, the Kingdom of Bahrain, then a British-protected territory, issued a set of two stamps celebrating the Silver Wedding Anniversary of King George VI and Queen Elizabeth (later the Queen Mother- Scott #62-63). 21,984 sets were issued and Scott '11 prices it unused at $48.75 . Issues of Bahrain, especially those of the British period, are sought after both in Bahrain and among British Commonwealth collectors, and British Royal Family issues have additional topical appeal. There are a number of scarce issues from the Gulf States which I view as bargains. Assuming that these countries can maintain their economic growth, diversify away from their current near-total dependence on oil revenues, and avoid internal political instability or military conflicts with some of their noisier neighbors, their better stamps should all do well.